Help keep Victoria safe by looking out for reckless and dangerous fire behaviour in our towns, parks and forests this summer. Whether recklessly or deliberately lit, bush and grass fires have disastrous consequences. It is a criminal offence under Victorian law to cause a bushfire recklessly, or to be reckless as to the spread of a fire to vegetation or property belonging to another. Reckless behaviour can include disobeying restrictions relating to total fire ban or fire danger periods, leaving campfires unattended, burning off without a permit, or using hot tools or machinery that emits flames or sparks on total fire ban days. “If you know of anyone engaging in reckless fire behaviour, or have any information about reckless or deliberately lit fires, we urge you to make a report to Crime Stoppers Victoria confidentially.” said Crime Stoppers CEO, Erika Owens. CFA Chief Officer Steve Warrington said the organisation took a zero tolerance approach to any unauthorised fires or fires resulting from negligent behaviour subject to police investigation. According to Victoria’s Crime Statistics Agency, there were over 29* offences recorded for ‘causing a bushfire’ during 2018. Assistant Commissioner Michael Grainger reminded the Victorian public that reckless fires are not only dangerous, offenders will also receive serious penalties. Recklessly lit fire such as failing to properly extinguish a campfire is a crime that carries severe penalties. Penalties for causing a bushfire include up to 15 years imprisonment or fines of over $36,000. The maximum penalty for arson resulting in death is 25 years imprisonment. 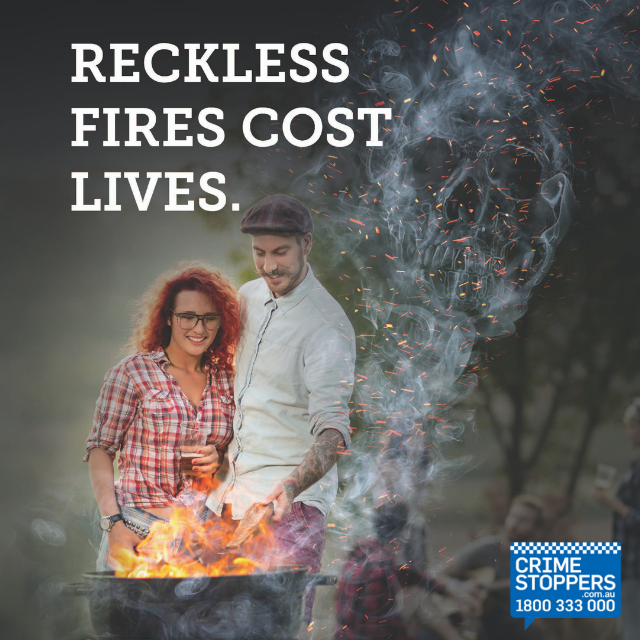 People who know of reckless or deliberate behaviour that could lead to a bushfire are urged to report to Crime Stoppers Victoria, on 1800 333 000 or at www.crimestoppersvic.com.au. You don’t have to give your name, and all reports are completely confidential. In an emergency, or if you see smoke or flames, contact 000.